The computer in question is the company’s new MacBook Air, which went on sale last week, starting at $999—a price that’s very low for an Apple laptop, though hardly a bargain for a Windows one. The new Air comes in two sizes. The base $999 model has an 11.6-inch screen (versus 9.7 inches for an iPad) and weighs 2.3 pounds (versus 1.5 pounds for an iPad). The larger—but still thin and light—model starts at $1,299, has a 13.3-inch screen, and weighs 2.9 pounds. I’ve been testing both versions, but especially the 11.6-inch model, and I find that, despite a few drawbacks, they really do offer the different, more iPad-like experience Apple claims they do. Battery life is strong, and the wake up from sleep is almost instant, even after long periods of being unused. Apple’s new MacBook Air laptop. Also, the company has re-engineered the way these new Airs sleep, adding a long “standby” period of very low power consumption that Apple says lasts up to 30 days. This standby mode kicks in after about an hour of idle time, and replaces the traditional hibernation system, where your current activity is saved to a conventional hard disk just before the battery dies. With hibernation, getting back to where you were can be slow and somewhat uncertain. With the new “standby” mode, the process just takes a few seconds, only a bit longer than normal sleep. These are just the first of a number of changes Apple plans in order to make its computers behave more like the iPad and iPhone, without losing their greater power and more traditional keyboards, touchpads and mice, and ability to run conventional programs. For instance, Apple has said it will soon introduce an “app store” for the Mac, which would make it simpler to find and download programs for the computers, and notify users of updates. And it will also roll out, in its next Mac operating system, called Lion—due next summer—a system of apps icon screens, like those on iPhones and iPads, that you can flick through with the company’s multitouch touchpad gestures. In my harsh battery tests, I found the two new Air models almost matched Apple’s battery claims, even with all power-saving features turned off, Wi-Fi kept on, the screen on maximum brightness and a continuous loop of music playing. The 11-inch model lasted four hours and 43 minutes, versus Apple’s claim of up to five hours. 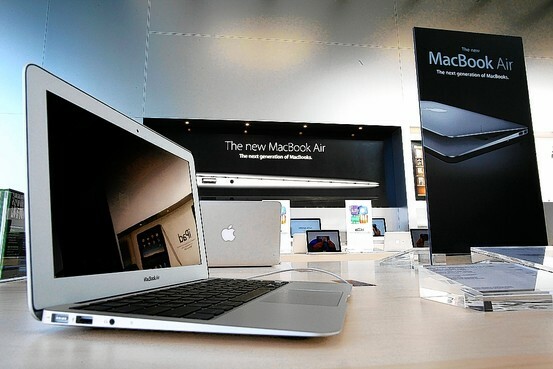 The 13-inch model lasted six hours and 13 minutes, versus Apple’s claim of up to seven hours. This means that, in normal use, with power-saving features turned on, you’d be almost certain to meet, or possibly exceed, Apple’s claimed battery life. For comparison, I did the same battery test on a new Dell 11.6-inch model, the M101Z, which costs about $450, but is much thicker and heavier than the smaller Air, and uses a conventional hard disk. It got only two hours and 41 minutes of battery life, which means that in normal use you’d probably get three to four hours. 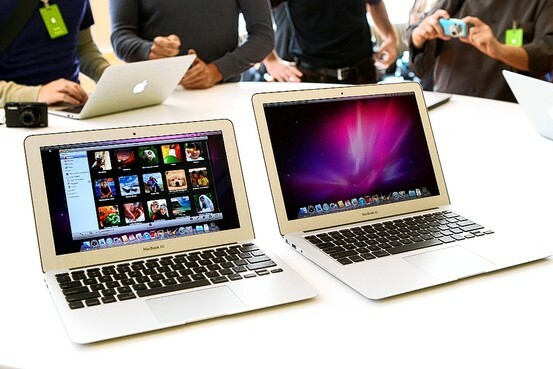 The MacBook Air 11-inch (left) and 13-inch models have long battery life, but storage capacity is limited. In my tests, a cold boot took 17 seconds and a reboot, with several programs running, took 20 seconds. By contrast, the Dell I tested took more than three minutes to fully boot up and be fully ready for use. The new Airs aren’t meant to be the most robust machines. They use last-generation Intel processors and have only two gigabytes of memory in their base configurations, and their storage is well below typical hard-disk capacities. For example, the 11-inch, $999 model has a paltry 64 gigabytes of storage; the 13-inch model starts at a still-weak 128 gigabytes of storage, and even the high-end version of the larger model, which costs $1,599, has just 256 gigabytes of storage. And neither the storage nor the memory can be expanded once you choose your initial specs. I’d recommend buyers of the 11-inch model spend $200 more to double the storage to 128 gigabytes. And people doing a lot of video editing might want to double the memory on either model to four gigabytes, for an extra $100. Also, as with the earlier Air models, these two lack a DVD drive and an Ethernet port. Apple sells an external drive for $79 and an Ethernet adapter for $29. If you add in all these extras, prices can climb quickly. They also lack ports called HDMI ports, becoming common on Windows PCs, for easy connection to televisions, and their keyboards aren’t backlit. The two new models do, however, have two USB ports instead of the single USB port in the older Air. I was surprised to find that even the base $999 model was powerful enough to easily run seven or eight programs at once, including Microsoft Office, iTunes and the Safari browser with more than 20 Web sites open. It also played high-definition video with no skipping or stuttering. So, if you’re a light-duty user, you might be able to adopt one of the new Airs as your main laptop. If you’re a heavy-duty user, who needs lots of power and file storage, they’re likely to be secondary machines. Overall, Apple has done a nice job in making these new MacBook Airs feel more like iPads and iPhones without sacrificing their ability to work like regular computers. But, as always with Apple, you’ll pay more than you will with Windows PCs.